As a child of the late 80’s, I was raised on Disney classics. To all of you on the latter half of the millennial timetable, I’m talking pre-Pixar, if you can imagine that. 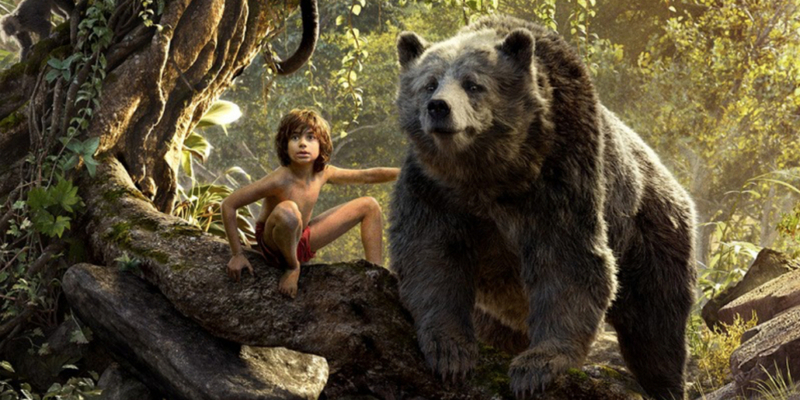 Walking out of the theater, I felt as though I could write a novel in response to The Jungle Book, but for the sake of your time I’m going to stick to the “bare necessities”. Sorry. I had to say it. Moments before the movie started, Producer Jon Favreau popped up on screen to thank people for coming to the theater and spend time praising all of those involved in the making of the film. At first instinct, I felt as if I was re-watching ELF, a Favreau classic that is slightly predictable with its guided narration and storybook setup. It felt entirely too unoriginal. But within seconds, that preconception had disappeared as the camera moved quickly through the jungle in an intense chase scene. Visually stunning looks at all parts of the jungle, from the cold and gloomy bottoms to the monkey-touting treetops, kept me wide-eyed and attentive as the movie progressed. Talking animals are introduced throughout the film, all done with precision; and none of which felt overly artificial. It’s worth mentioning that Bill Murray as Baloo was the perfect casting for the film. In a matter of seconds, the crowd was roaring with laughter simply by vocal affiliation. For me, I had no previous knowledge of Murray’s involvement, leaving me grinning ear-to-ear as we were introduced. But the most astonishing detail about this gorgeous film is how little of it was real. Gorgeous animation and CGI built the personalities of our favorite childhood character while preserving what we remember from the original animations. (Teenage Mutant Ninja Turtles, take note – you ruined the fun-loving Michelangelo that raised me and turned him into an attendee of the Arnold Classic) With only one human character in the film, 12-year old Neel Sethi exceeded all expectations with a performance that can only be attributed to a childlike imagination and raw talent guided by the film’s production team. There is a moment in the film where Mowgli is sitting atop of Baloo as they float down the river singing and drumming. As I watched Sethi naturally having a great time, splashing water and running his hands through Baloo’s fur coat, I couldn’t help but wonder if Bill Murray himself had been sitting below Sethi, covered in green screen material so that animators could create what we see on the screen. It was magical. What Favreau did best here was preserve a childhood classic cartoon while adding elements of surprise along the way to keep the viewer captivated and concerned for the beloved Mowgli. Far too often classic films are chopped up and spun around in different directions, leaving viewers negatively nostalgic and bitter. Here, simply whimsy. Lead characters were only tweaked slightly, with a fierce and slightly scary King Louie and a very brief appearance of the manipulative Kaa. Characters are introduced as a small part of a much bigger story, but standalone in well-written short stories as Mowgli helps Baloo get honey and escapes the power-hungry King Louie with the strategic help of his friends. The Jungle Book is a spectacular film, surprisingly released mid-year with the performance of an end-of-year film seeking Academy nominations. I was emotionally invested, finding myself choked up and fighting back tears in some heartstring-pulling family moments and laughing out loud as if I were 12 again at other times. The Jungle Book is family-friendly with only a few scenes that would be deemed scary to a younger child. I expect this to break some barriers in both box offices and living rooms. As we walked out of the theater, I heard young parents excitingly connecting the film to their own childhood. Any filmmaker that can preserve a story across generations is doing the world a favor worth supporting. *Note: I did not see The Jungle Book in IMAX or 3D so I can not speak to the quality, however it was shot very similarly to Avatar, so I can only expect a great visual experience if your eyes can handle it.